Why do my cucumbers bloom without setting fruit? Cucumber plants produce both male and female blooms. 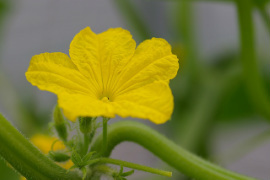 The male blooms appears on a slender stem, while the female bloom has a swollen ovary that looks like a miniature cucumber at the base. Male blossoms appear a week or two before the female blossom to attract bees to the garden. The purpose of the male blossom is to produce pollen to pollinate the female bloom - but it does not produce a cucumber on its own. Bees visit the male cucumber blossom where the pollen sticks to their hairy legs and bodies. When the bee visits a female bloom, a sticky substance on the anthem in the center of the female blossom attracts the pollen. Notice the yellow pollen clinging to the bee above. He carries the pollen from bloom to bloom to pollinate your cucumber plants. 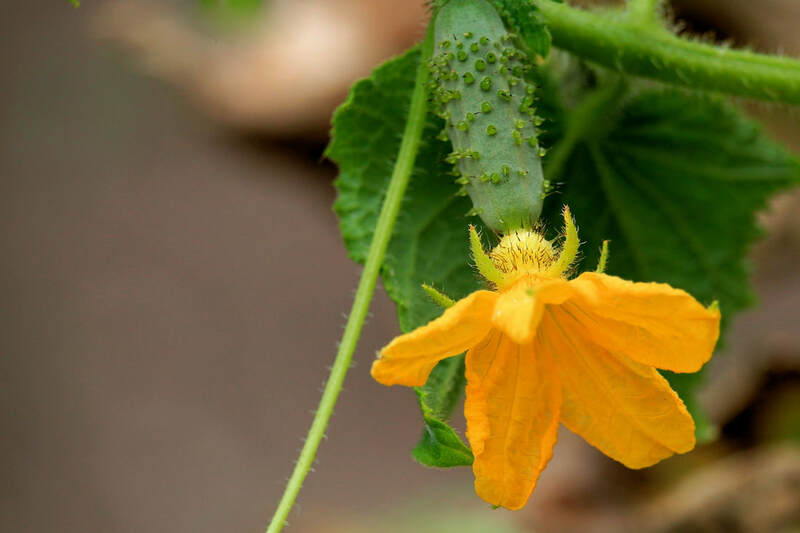 When female blooms are pollinated, the tiny cucumber at the base begins to grow and the blossom shrivels, turns brown and falls from the end of the cucumber. If the bloom is not pollinated, the tiny cucumber at the base of the female blossom rots and falls off the plant, too. ​Usually, your concerns about blooms that are not setting fruit are unfounded and what you are observing is simply a flush of male blooms that appear before the female blooms arrive. Give your cucumbers a week or two to produce female blooms. Sometimes a lack of bees, or a prolonged period of rainy weather, or extremely hot weather interferes with pollination. When this happens, you can hand pollinate your cucumbers to insure a good supply. Use a clean artist's paintbrush to collect pollen from the male blooms and transfer the pollen to the female blooms by hand. Gather more pollen as you go. Even though on brush full of pollen can be used for several female blooms, keeping the brush filled with pollen ensures good pollination.